Across the world of mammals, teeth come in all sorts of shapes and sizes. Their particular size and shape are the process of millions of years of evolutionary fine-tuning to produce teeth that can effectively break down the foods in an animal's diet. As a result, mammals that are closely related and have a similar menu tend to have teeth that look fairly similar. New research suggests, however, that these similarities may only be "skin deep." The teeth at the back of our mouths—the molars—have a series of bumps, ridges, and grooves across the chewing surface. This complex dental landscape is the product of the spatial arrangement of cusps, which are conical surface projections that crush food before swallowing. How many cusps there are, how they are positioned, and what size and shape they take together determine our molar's overall form or configuration. In a study published this week in Science Advances, an international team of researchers from Arizona State University's Institute of Human Origins and School of Human Evolution and Social Change, New York University, University of Kent, and the Max Planck Institute for Evolutionary Anthropology found that a simple, straightforward developmental rule—the "patterning cascade"—is powerful enough to explain the massive variability in molar crown configuration over the past 15 million years of ape and human evolution. "Instead of invoking large, complicated scenarios to explain the majors shifts in molar evolution during the course of hominin origins, we found that simple adjustments and alterations to this one developmental rule can account for most of those changes," says Alejandra Ortiz, a postdoctoral researcher at Arizona State University's Institute of Human Origins and lead author of the study. In the past decade, researchers' understanding of molar cusp development has increased one hundred-fold. They now know that the formation of these cusps is governed by a molecular process that starts at an early embryonic stage. Based on experimental work on mice, the patterning cascade model predicts that molar configuration is primarily determined by the spatial and temporal distribution of a set of signaling cells. 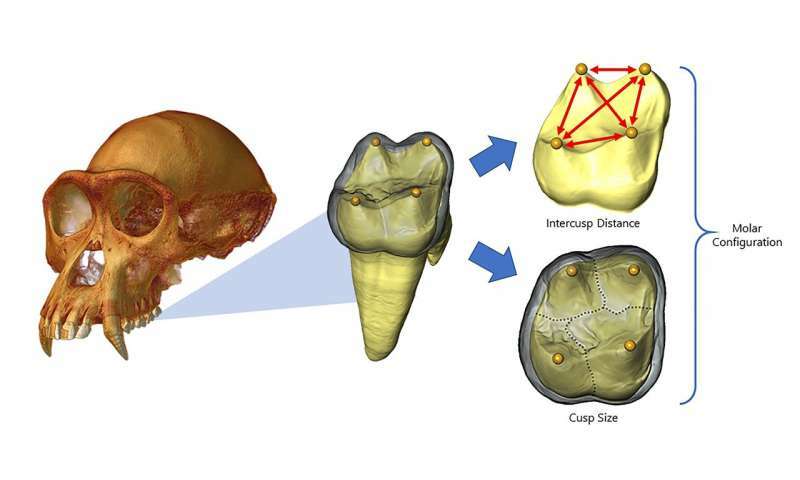 Using state-of-the-art micro-computed tomography and digital imaging technology applied to hundreds of fossil and recent molars, Ortiz and colleagues created virtual maps of the dental landscape of developing teeth to chart the precise location of embryonic signaling cells from which molar cusps develop. To the research team's great surprise, the predictions of the model held up, not just for modern humans, but for over 17 ape and hominin species spread out across millions of years of higher primate evolution and diversification. "Not only does the model work for explaining differences in basic molar design, but it is also powerful enough to accurately predict the range of variants in size, shape, and additional cusp presence, from the most subtle to the most extreme, for most apes, fossil hominins, and modern humans," says Ortiz. These results fit with a growing body of work within evolutionary developmental biology that very simple, straightforward developmental rules are responsible for the generation of the myriad complexity of dental features found within mammalian teeth. "The most exciting result was how well our results fit with an emerging view that evolution of complex anatomy proceeds by small, subtle tweaks to the underlying developmental toolkit rather than by major leaps," says Gary Schwartz, a paleoanthropologist at ASU's Institute of Human Origins and a study coauthor. "That all of this precise, detailed information is contained deep within teeth," continued Schwartz, "even teeth from our long-extinct fossil relatives, is simply remarkable." "Our research, demonstrating that a single developmental rule can explain the countless variation we observe across mammals, also means we must be careful about inferring relationships of extinct species based on shared form," said Shara Bailey, a coauthor and paleoanthropologist at New York University. "It is becoming clearer that similarities in tooth form may not necessarily indicate recent shared ancestry," added Bailey. Exactly how some populations of modern humans, and some fossil hominin species, evolved complex molars with many cusps of varying sizes, while others evolved more simplified molar configurations, however, is unknown. There is no way that random events can even begin to create specifications for something as fundamental as teeth. Firstly, how does an organism without the necessary genes get to the point where it can develop a means to absorb the right materials and then transform them into dentine - if it didn't have any template in the first place? Secondly, how does it integrate said teeth into a LIVING system such that the teeth have blood supply, nerves, enamel etc. This does NOT happen by accident. Teeth are there for a much larger PURPOSE which is non random.